It was a sloppy race and Mitch and the dogs trudged through up to three feet of water on top of the ice on the Kuskokwim and Gweek rivers. Some of the mushers got in over their heads. Luckily no one was seriously injured. It was quite a test for the teams and Mitch’s dogs pulled through for a first place finish. The weather was challenging. We had 30-40 degrees with 40 mph winds. A lot of the dogs that were dropped were stranded in the village until today when planes could fly again. 2 mushers decided to wait out the thaw and are still running the race. The holed up in Kalskag until the water froze. They should be on the trail now. It’s been a great experience to host a musher. We have learned a lot about the sport and strategy of mushing. And it was a special treat to host the first place winner and his handler Jake. They were our first overnight guests in Bethel. 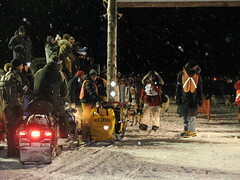 Tom got to use his snowmobile to hold the sled in place at the starting line. Can you pick him out in the picture? It will be fun to follow this crowd on the Iditarod trail in a few weeks. Hey I can pick Tom out. It’s the head gear. I love your mittens. Bet they are warm. Sounds exciting to have hosted a team! WOW. It was fun! Hope your doing well. Keenan might want to hang out with you for a while this winter. He is planning a trip to Vermont.